Start with a clear understanding of who your company is. This should be considered the main — and perhaps most important ingredient; because without this as a foundation to your recipe, you will make a bloated, bland IVR, devoid of flavor. 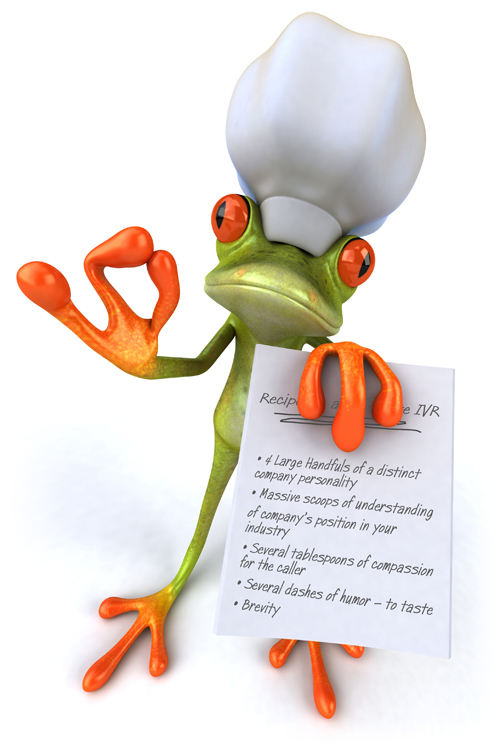 Be absolutely sure of your company’s personality. Now, measure out an approximation of where your company is in the industry — are you on the forefront and driving change? Or flying under the radar? Keeping up a steady, yet unobtrusive profile, or shaking things up? Sift this in with the first ingredient, making sure to integrate everything together. Next — and this is critical for taking your IVR to the next level — gently fold in several tablespoons of compassion of the caller — remember your last frustrating experience maneuvering through an IVR which threatened to take up your whole day. You felt helpless and powerless; like being elbow-deep in flour, halfway through a Julia Child recipe, realizing that your dried mushrooms have not been soaking in merlot for the past 12 hours as directed. Add liberal amounts of compassion throughout — the caller just wants to get where they want to go. Don’t make it difficult for them. Flavor your recipe generously with humor and lightness: too many IVRs are a serious concoction of dry, flavorless content — sitting there like a massive pound cake. Use your IVR to tempt the taste buds; serve as an unforgettable appetizer — a preview of the “main course” — which is the actual service and live interaction that the caller can expect. Now that you have all ingredients prepared, keep in mind that brevity is at the heart of all great call flows; think of a small, eye-catching appetizer which leaves the caller wanting more. People are busy; time is limited. We’re not taking about fast-food here; bland, forgettable, but served quickly: think of your IVR as a delicacy, bursting with flavor, and never heavy, time-consuming, overwhelming, or filling. Serve immediately; proudly. Knowing that your IVR has greeted callers brightly, tastefully, and respectfully. Enjoy! Allison Smith is an internationally recognized professional voice talent, specializing in voicing telephone systems. Allison is also a Certified FreePBX Partner. If you’ve maneuvered through telephone prompts while calling a Fortune 500 company, participated in a telephone customer satisfaction survey, signed onto a conference call, listened to the public airwaves, took an online training module, or even received an automated call notifying you of an upcoming medical or dental appointment — chances are, you’ve heard Allison. One of the most prevalent and widespread telephone voices working today, Allison has voiced platforms for Vonage, Bell Canada, Sprint, Cingular, Verizon, and Qwest, as well as the Open Source PBX Asterisk. Clients include PetSmart, Kennedy Space Center, 3M, Pfizer, Toyota, Victoria’s Secret, Bank of America, and eBay among many others. Her voice is pre-installed in the FreePBX Distro, and she provides the basic stock prompts for voicemail and IVRs. Allison’s web site is www.theivrvoice.com.